Hey guys! 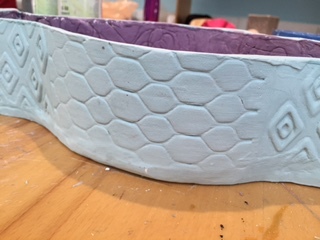 So in this post, I will be talking about my 2nd ceramic formative, where I will show you the steps I took to get my organic-shaped container, and then I’ll be reflecting on the process in the end. 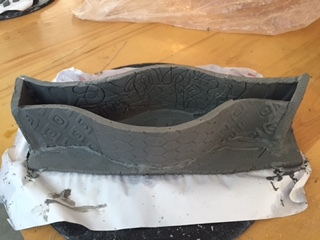 – I rolled out a slab of clay, fixed its shape so that it becomes a rectangle, then placed it on a roof-part I found in class, so that the clay can form into that shape. 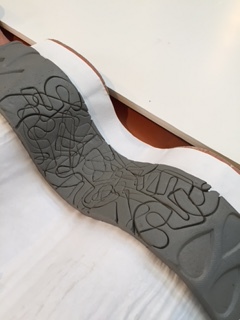 While it was sitting there, I used a roller to design the clay’s ends, and a fence-wire part to engrave its design in the middle. 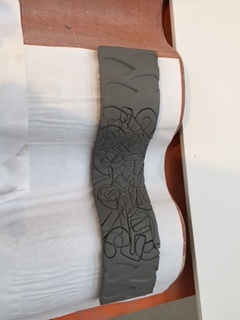 – This slab of clay followed the same process as the previous image, except with a slightly different form, and different designs. To design the ends, I used a tear drop stamp, and for the middle I used some cookie cutters (shaped as the number 1 and the number 5) and overlapped them against each other to form that weird, cool design =) . 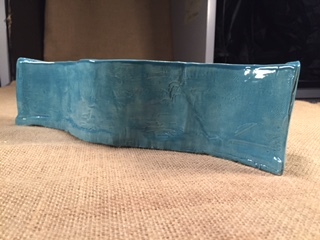 – This is a close-up picture of the first slab of clay. You can see the design better here. – This is also a zoomed-in image, but of the second slab of clay. I tried to get a good view of the middle design with the tear drops in the end. – I assembled the two slabs together to form this cool shape, and put them on an texture-free slab as the base. 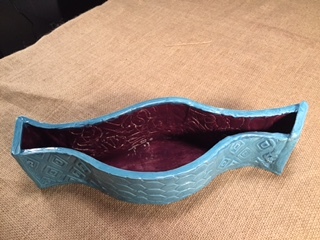 – I cut off the excess clay of the base and made sure to make my container as smooth as possible where there is no texture. 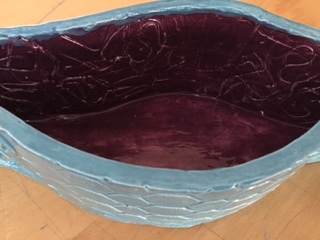 – I applied a dark purple glaze on the interior of my container, and a light turqoise blue on the exterior (since blue is my favorite color, and different blue hues seem to look great on ceramics – like on my previous formative). 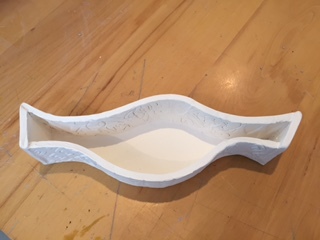 – Tilted Bird’s Eye View: Once it got fired. Very satisfied with this result, much more than my previous formative. 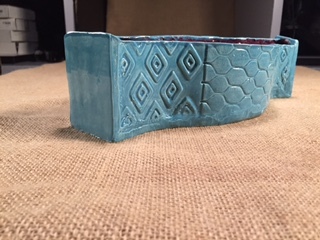 – Professional photography: Ceramics’ Runway =D I took very clear and sharp photos of my form container in a special room, the results look fantastic! 1) What was it you were trying to do? 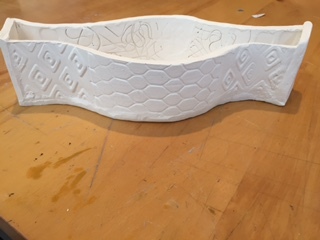 For my second ceramic formative, I wanted to create something with the form technique. 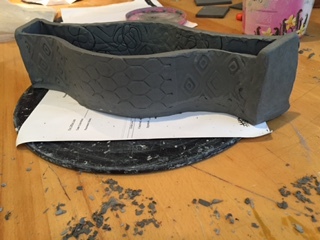 Instead of making a cube, or a cylinder, I wanted to create something more organic; so I chose to form two slabs onto a curved roof tile we had in class. 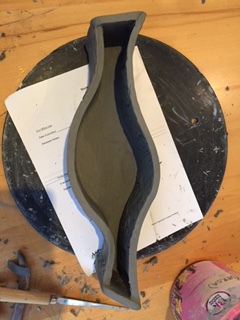 I had to roll out two slabs of clay for the sides that would stick together, and a third slab for the base (to make a container). 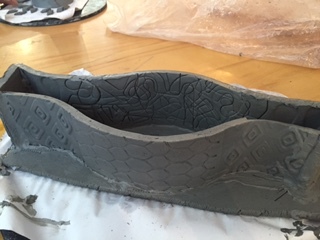 I also wanted to experiment with engraving pattern to create texture on my ceramic. 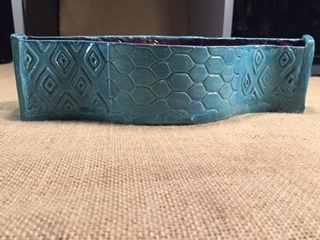 I used a piece of fence wiring that created a hexagonal pattern, and a diamond engraving roller blade, to make the design on the first slab. I used cookie cutters in the shape of a 2 and 1, and a teardrop stamp, to design the second slab. I really liked how they ended up looking together, they worked well creating two unique, creative designs. 2) How well do you think you accomplished it? 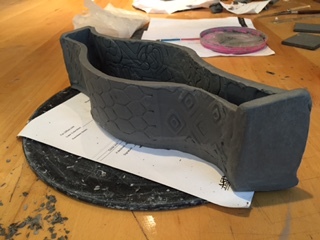 I really like the final product of my form ceramic. 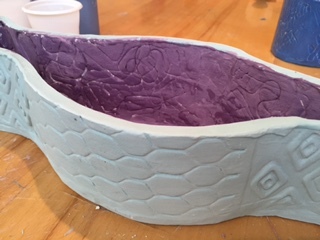 It looks so much better than my first formative, especially because I chose more harmonious colors to glaze it with, that looked good together when it was fired. 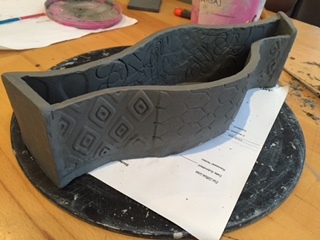 I also spent quite some time cleaning it up before it was fired to become bisque. 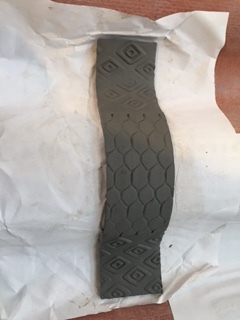 I cut off all uneven edges and parts, and smoothed all the sides with a rubber rib. So, as a whole, I think this piece turned out very successful, and I very proud of its final look. 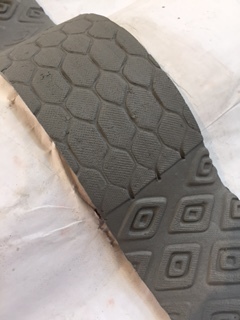 After I had engraved my entire design and left the slabs to dry, they ended up drying too fast, and so as I tried to assemble them they cracked and broke. This was unfortunate, but it taught me a lesson; that I have to check up on my clay more often so that such accidents don’t occur. This also reminded me that clay needs a lot of attention and care, and so for my future projects with this media, I will be more careful handling it. So, after my first attempt broke, I created a second one, and thankfully, it survived (as you can see above). 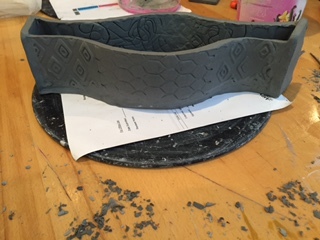 Though, my second attempt also broke at one point, and so I’ve come to the conclusion that the roof tile’s curved shape is not very suitable for clay. 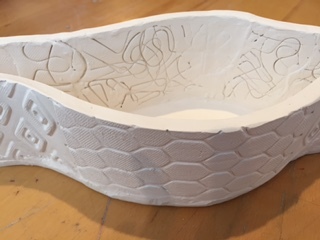 This formative showed me however, that when clay has just been rolled into a slab, it will be engraved very easily, which helped create such clean and sharp texture. You can see the texture clearly, even from a distance.